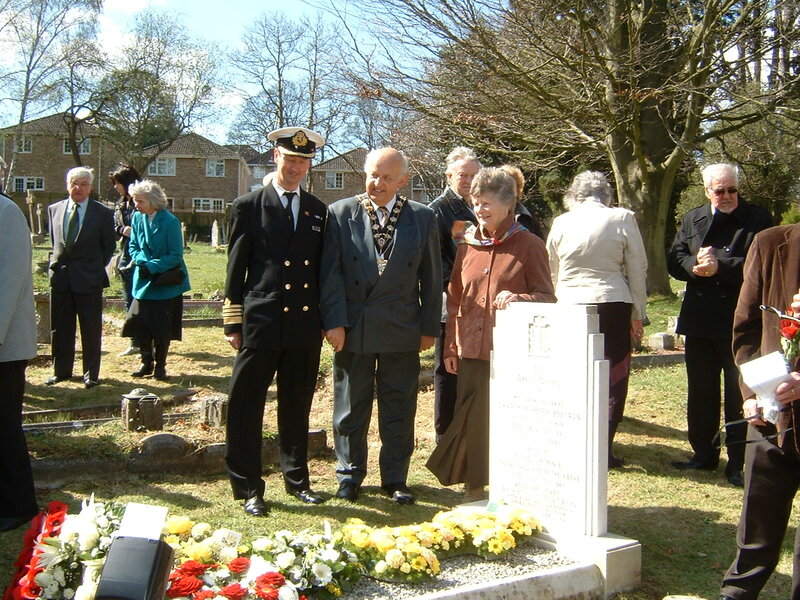 Captain Christopher Wells from Cunard, The Mayor of Eastleigh Cllr Wayne Irish and Mrs Rosemary Pettet at the grave of Captain Rostron on the centenary of the loss of the RMS Titanic. 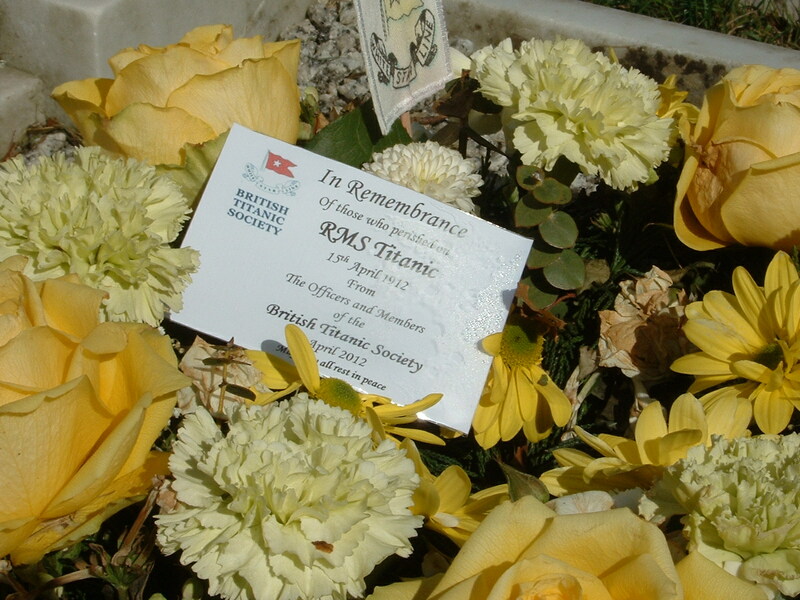 The old burial ground in West End was on the world stage this morning, as West End Local History Society hosted a wreath laying ceremony on the grave of Sir Arthur Henry Rostron, KBE, RD, RNR, the Captain of the RMS Carpathia, on the centenary of his actions that rescued 706 survivors from the Titanic. Over 100 people, from Britain and America, packed around the grave to participate in the service, led by the Rev. Brian Pickett MA, Vicar of St James’ Chuch West End. 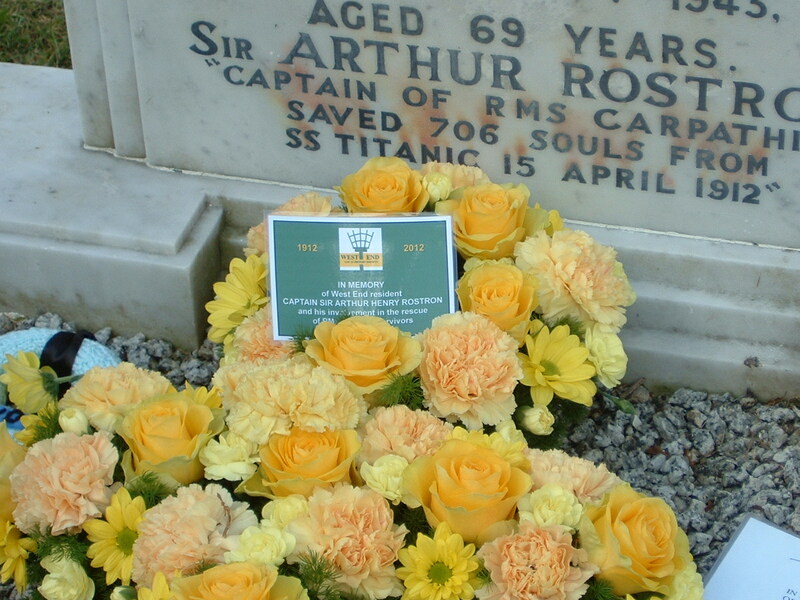 On this hundredth anniversary of the sinking of the Titanic we remember the lives of the passengers and crew that were lost, but we also give thanks for the lives that were saved and give thanks to Captain Rostron and the crew of the RMS Carpathia for saving the lives of others. The first wreath laid was from the West End Local History Society, laid by Mrs Rosemary Pettet the Grand-daughter of Captain Rostron. 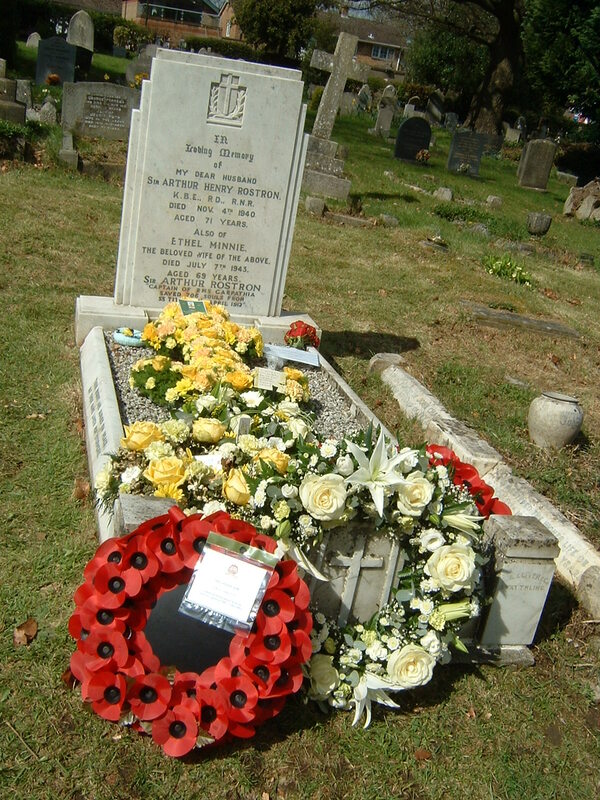 The grave was cleaned and restored in 1999 and a wreath was laid by Capt Rostron’s Daughter, Margaret Howman that year. She kindly left us some money to continue that tradition and the local History Society have been faithfully doing so every year since then. In memory of a heroic Grandfather, from two of your very proud Grandchildren, Rosemary and Gervas. Another wreath was laid by Captain Christopher Wells, one of the Captains of the Queen Mary 2, on behalf of Cunard, the shipping line which merged with the White Star Line in 1934. 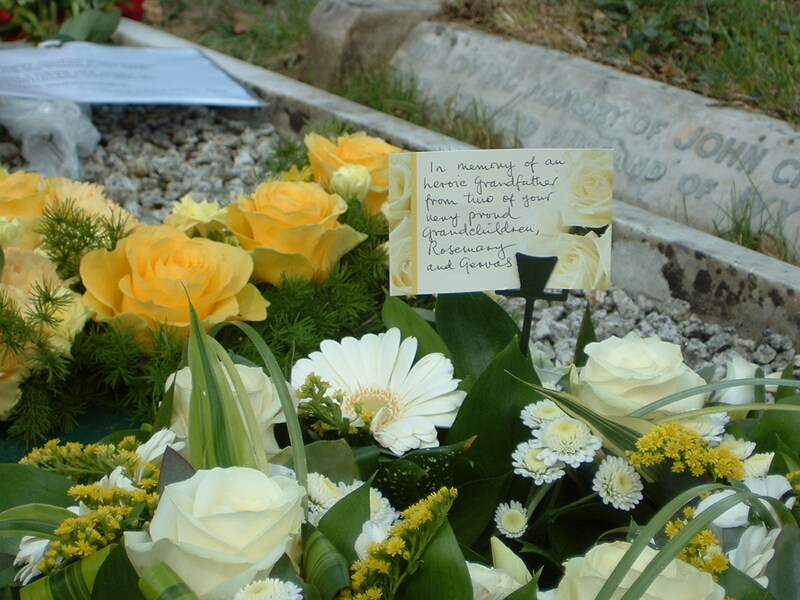 There were further floral tributes, including from the Mayor and City of Southampton and the Southampton Master Mariners’ Club (The Cachalots). After the formal wreath laying, the Rev. Brian Pickett led the prayers, the assembled congregation then sang the hymn “Eternal Father” (For those in Peril on the Sea) before the service closed with a blessing. We have two new Titanic Memorial plaques in the Museum in West End, designed to reflect the character of the ship. The main plaque is of burnished black iron on a teak mount in sympathy with the materials used in the building of Titanic. It was donated by HEWEB [n.b. The Hedge End West End & Botley Local Area Committee of Eastleigh Borough Council] and remembers four local citizens connected with the Titanic, Captain Rostron of the Carpathia, John Lovell Diaper, James Jukes and Fred Woolley, Secretary of the Titanic Relief fund. The second plaque has three links of heavy iron anchor chain mounted on a section of teak deck as it would have appeared laying on the fore deck of Titanic. It was donated by the Diaper Heritage Association, and is a memorial to John Lovell Diaper, who was lost but not recovered. The West End Museum is located in The Old Fire Station, High Street, West End SO30 3FB. It is open on Saturdays, between 10am and 4pm. Entrance is free.